Toronto by First Edition Tea Co.
First Edition Tea Co.’s Toronto came to me as part of The Sugared Teacup’s June themed subscription box. Toronto came to me in a cute little sealed (and resealable) 10g sample bag – too cute! I’m a fan of nice packaging, and First Edition Tea Co. did not disappoint. Toronto is part of their Wanderlust collection which features 4 other cities from around the world (Marrakech, Paris, London, and Mumbai). 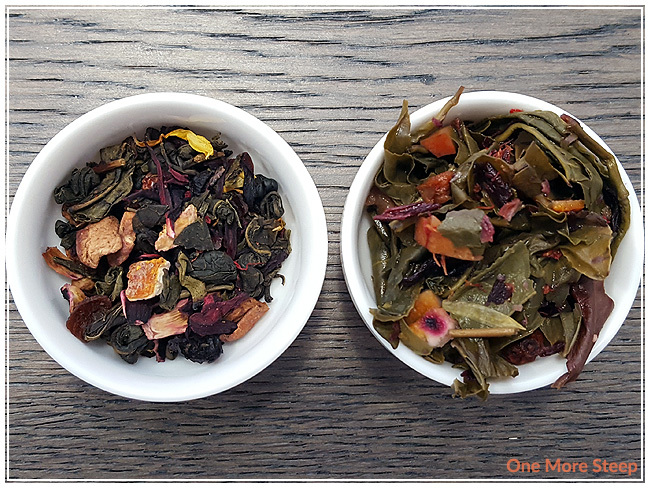 Toronto is described as an “apple, peach & maple green tea”. If you’re going to make a tea inspired by a Canadian city, I think maple is kind of necessary. When I first opened up the bag, I was pleasantly surprised. The tea smells like what it described on the front. Apples? Check. Peaches? Double check. Maple? Oh yes, please. 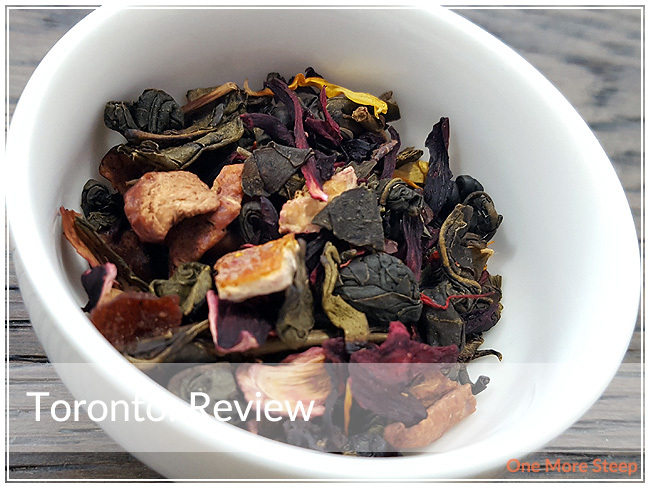 The ingredients in Toronto are: green tea, hibiscus petals, rosehips, apple pieces, orange pieces, calendula petals, safflower petals, real maple syrup, and natural flavours. If you’re confused by the lack of peaches in this apple, peach, and maple green tea, you’re not the only one. I’m hoping that the peach aroma that I can smell from the dry leaf is from the natural flavouring, or else I feel like I should be concerned. 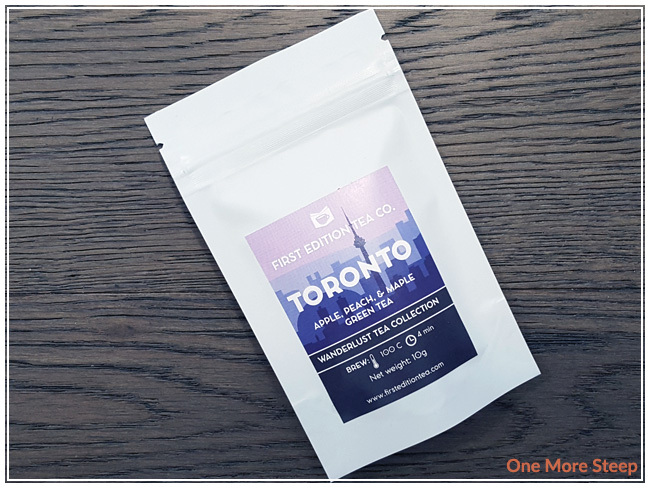 First Edition Tea Co. recommended steeping Toronto in 100°C (212°F) water for 4 minutes. Because it is a green tea base, and I only have 10g to play with, I was a bit cautious and steeped at a lower temperature. I steeped this green tea blend at 80°C (175°F), which is the green tea setting on my Breville IQ Kettle. I did steep it for 4 minutes. Toronto is apparently a pink city! I think the colouring is primarily due to the hibiscus in the mix. It’s a beautiful colour. 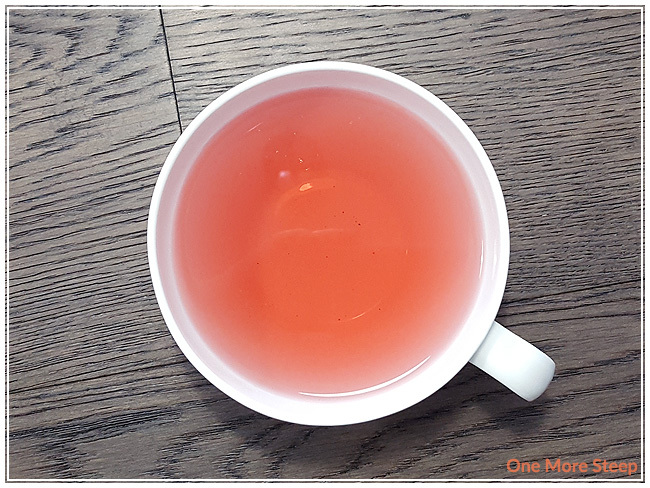 The aroma that comes up from this tea is full of apple and peaches and a hint of maple syrup. The aroma of this tea matches up so nicely with the description, I can almost forgive it for not actually containing peaches. On first sip, I find that this tea is tart. The maple adds a nice touch of sweetness to this tea that almost balances out the tartness from the hibiscus. I can taste a bit of apple, a bit of peach, and there’s a subtle but familiar vegetal taste in the background that could only be from the green tea base. With the mix of fruit, I’m not a huge fan of it as a hot tea. First Edition Tea Co. suggests this as an iced tea though, which is what I wound up doing after I let it cool to room temperature. The tartness gets a bit more subdued, but the fruitiness of the tea comes out a lot more when it’s cooled and iced. 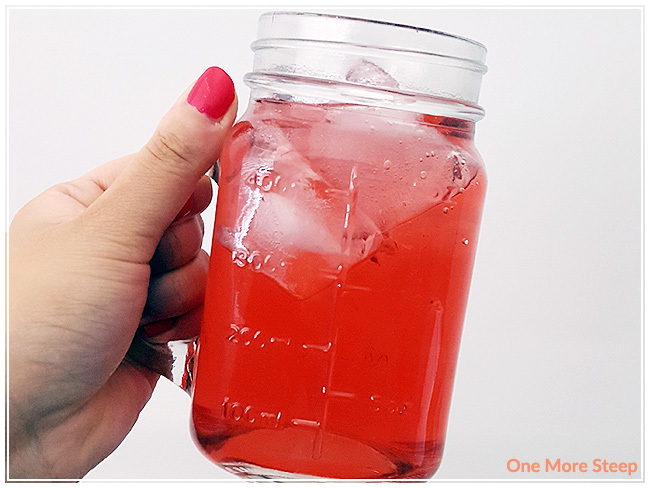 I would recommend having this tea iced. I attempted to resteep Toronto. It was a much paler pink and it lacked the tartness from the hibiscus. I found it was primarily the green tea base shining through on this tea and not quite the same experience. While I’m a fan of green tea in general, I didn’t think this blend did a great job with a second steep. I liked First Edition Tea Co.’s Toronto. While I didn’t like this green tea blend hot (or resteeped), I think the initial steep did an amazing job with being iced. 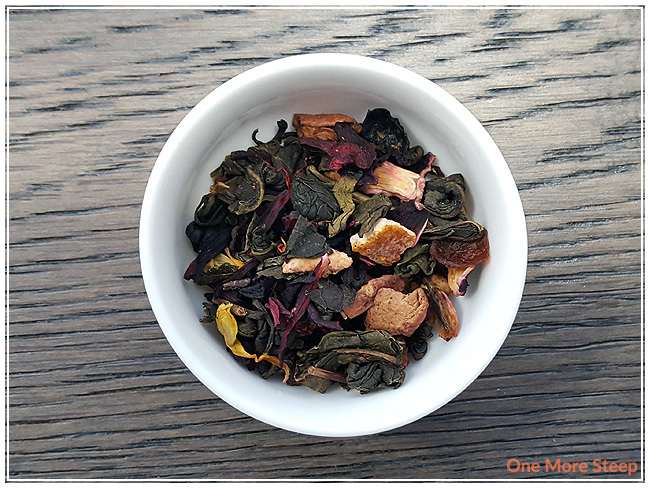 Definitely have this tea iced, the tartness of the hibisicus and fruitiness of the apple and peach flavours lends itself well as an iced tea (and it’s refreshing to boot!). Because of the maple syrup, I don’t think that this tea needs any sweetener as it’s got a nice amount of sweetness already to it. Still, I’m curious about where the peaches are, but I think the flavours in this green tea blend are really nice (and would strongly recommend having this one iced only).